Strolling down the street, it's amazing what you can do in this leisurely walk. Stop off to grab a delicious cup of coffee and a snack. Pop into your favourite shop to buy that particular item that you've had your eye on for a while. And you can also appreciate some fine pieces of art. No, this time I'm not talking about a visit to the local art gallery, but admiring works of street art. It's a notable trend as street artists use the everyday canvases of pavements, walls and façades as backdrops for their creations. The talent behind these creations is immense, with different styles and techniques making an instant impression. 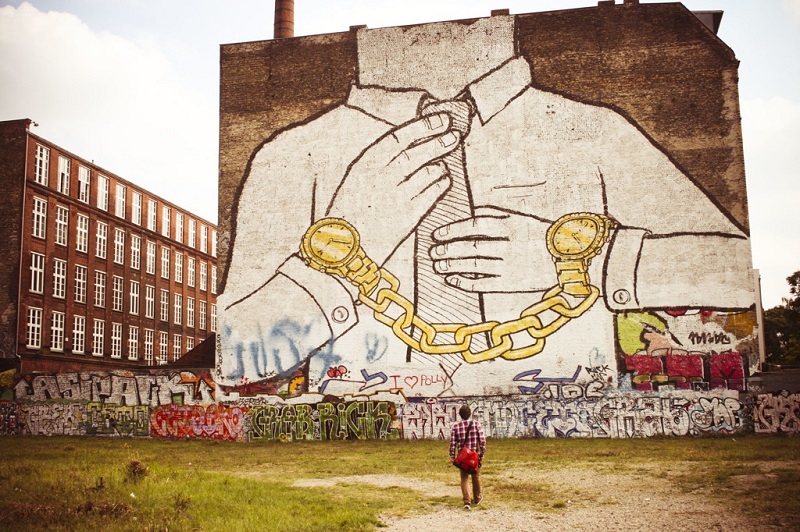 In fact, the concept of street art is nothing new. Back in the day, street artists would be bracketed under “Madonnari”, as the Madonna was a popular choice of artwork to be recreated in the streets. This concept can be traced all the way back to the 16th century. Many street artists were regular artists who had been commissioned to produce work for cathedrals or private homes – but extra money had to come in from another route, and street artistry was the answer. The artists would reproduce their artworks on pavements and street using materials such as coal and chalk. A common practice for the street artists was to attend local festivals, events and holy days and join in with the revelries. There, they would paint or draw with the aim of garnering many a coin from appreciative passers by or spectators. The piquant angles, distinctive characters and effective contrast of black and white and minimal colour add up to the brilliant work of Millo. Francesco Camillo Giorgino adopted the name of Millo to bring his creations to life on large scale murals. 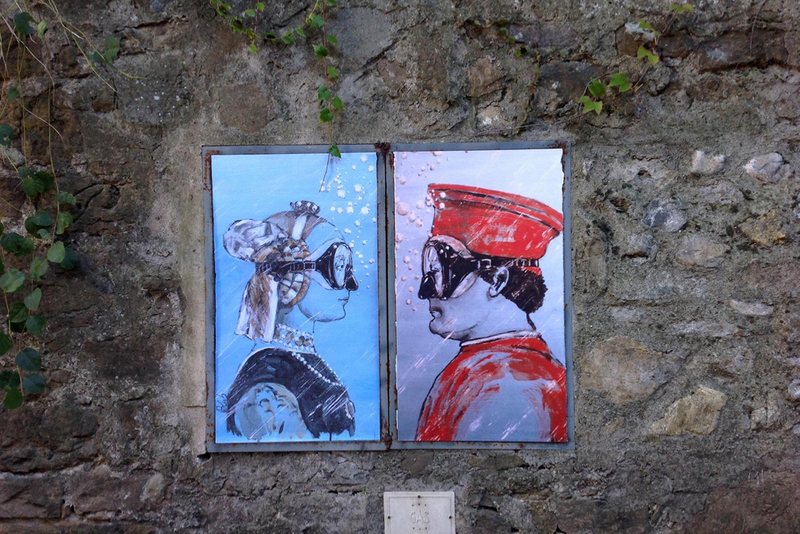 He has participated in many a street festival, and his work has been popular to warrant exhibitions both in Italy (Rome, Florence and Milan, for example) and abroad (in locations such as Paris, Luxembourg and London). 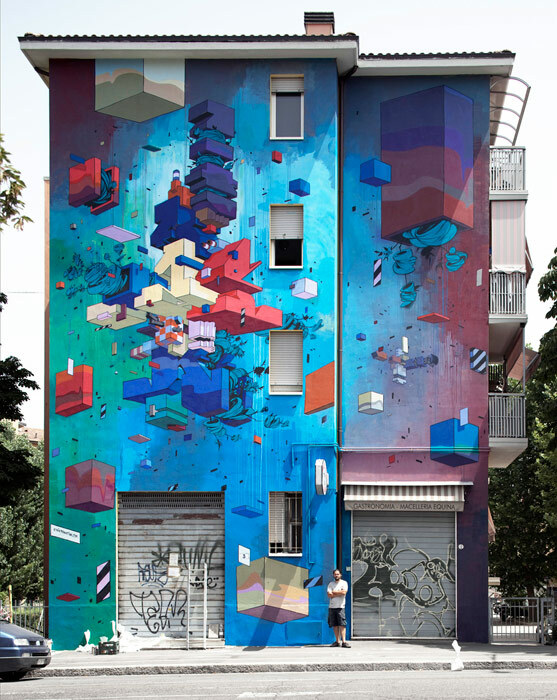 He has also won the prize to paint 13 multi-storey murals in Turin, a feat that was achieved last year. Millo has contributed artwork to walls (both interior and exterior), rooftops, and gates. His works include Mi Vida in Barcelona, a music-based piece that features the main character poking a pencil through a cassette tape as an enigmatic figure walks by (I thought that the figure had shades of the front cover of Neil Young's After The Goldrush album cover in a neat tribute). 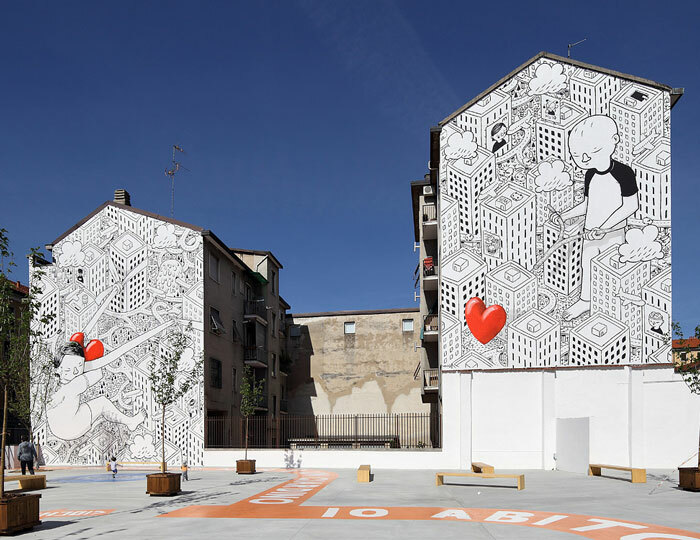 Other excellent examples include Love Seeker and the murals that Millo has created in the recent Turin project. He has his own website here. Sometimes, it's not just the walls that get the art treatment. 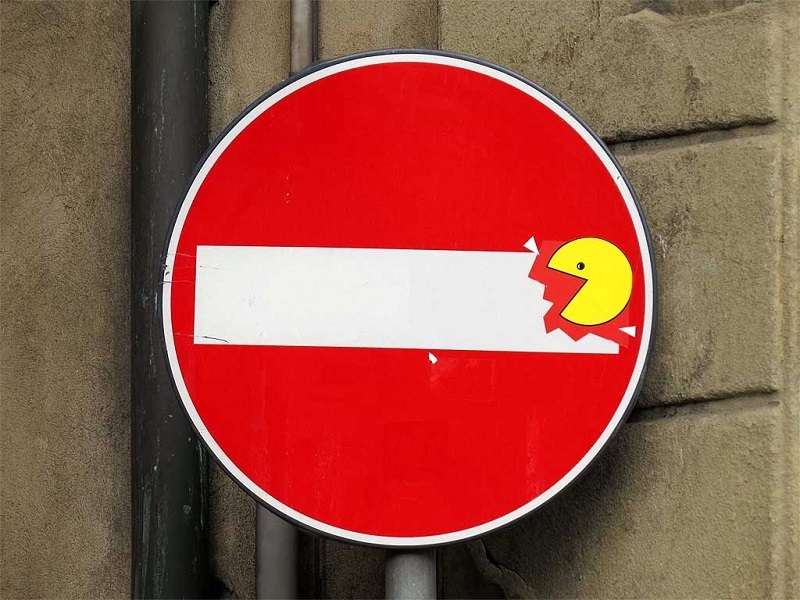 Clet Abraham has demonstrated this to great effect with his unique take on street sign art. 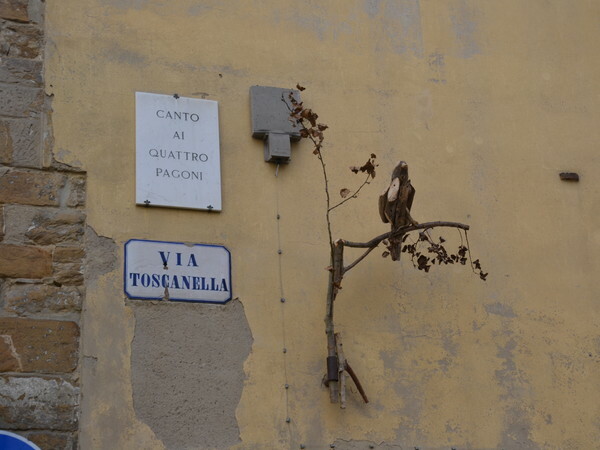 Originally from France, Clet is now based in Florence and has been giving street signs that extra artistic flourish since 1996. His artwork is simple but instantly recognisable and accessible, with removable stickers added to the signs to produce the effect. Besides Florence, Clet's work has been seen on signs all across the globe, including destinations such as Amsterdam, London and Paris. He has also exhibited in gallery locations that include Rome, Paris and Brittany. Among these unique pieces are a sun-seeker at the beach, a goalkeeper anxiously crouching down as a football hovers outside and of course, a painter! There's a Facebook page that includes links to his many innovative pieces. Etnik has a very notable style of street art. It comprises a series of floating geometric-style blocks of different sizes and shapes that come together to link with each other and form a greater whole. The blocks can be patterned, coloured and sometimes of the traditional office building – the end results are absorbing and highly unique. Etnik has been keeping busy this year, creating a number of excellent pieces using his signature geometric forms. These include a new piece made in September for the Urban Canvas Festival in Varese, a mural painted in April 2015 in Torpignattara for the Street Heart project, and a mural designed in March 2015 in Trento. If you think that the future's bright, then Pixel Pancho's art will be your cup of tea. Hailing from Turin, Pixel's large wall murals take a futuristic approach with the paintings depicting robotic creatures which are in various environments. The robots can be found in locations such as the beach, in a forest or in their natural science fiction-inspired habitat. A great trick of Pixel's is to use earthy colours to create an effective contrast. The colours create a feeling of greater age which are neatly juxtaposed with the futuristic subject matter. Pixel has worked with wall painting, poster painting and sticker art, and has worked in places including Canada, New Zealand and Argentina. Here's a link to Pixel's work. Why not dip into Blub's artwork that claims that art knows how to swim? Blub has produced art pieces that are part of L'arte sa nuotare, work that puts a unique twist on the genre. Based in Florence, Blub has placed a series of iconic figures and works of art in swimming masks. Examples to receive this treatment include Michelangelo's David, the Madonna and Botticelli. The mission is to bring these classic artworks into a wider fold and make them accessible to the public. If you like this artwork style, then take a look at the Instagram account that's updated on a regular basis with photos of further examples that include Shakespeare, the Mona Lisa and even Santa Claus! Instagram link here. Blu's street art career began at the end of the last century and in his time has received critical acclaim for his work. Blu works on a large canvas whatever his choice, and this is thanks to his technique of using telescopic sticks with painting rollers attached to the end. His work is known for his unique humanoid figures and this acclaimed style has won Blu a number of commissions and public projects. 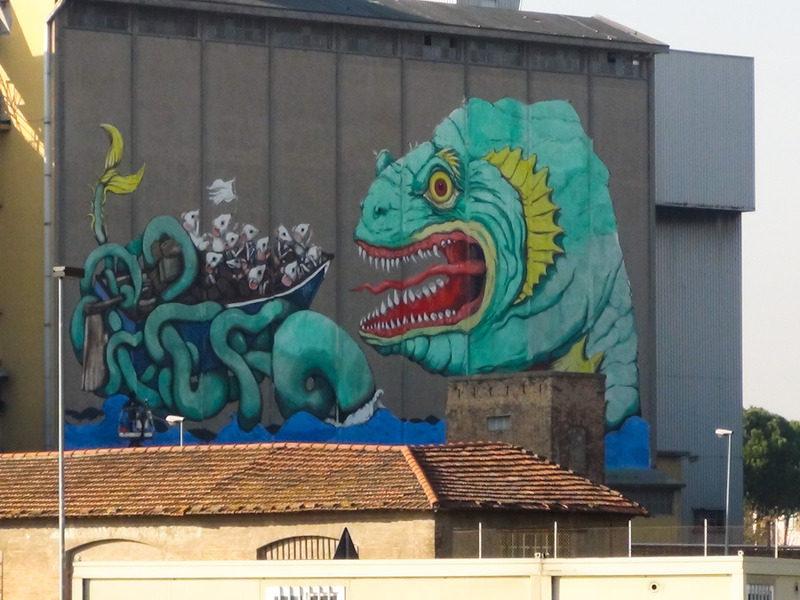 Blu has worked in tandem with other street artists and one of these was Ericailcane. Blu's human figures made a good contrast with Ericailcane's area of expertise which is animals. Ericailcane's animals are often brightly coloured, bold depictions – such as his recent work in July 2015 for the Vertigo Truth event, which presented two black and white war horses battling through a fire. As well as conventional drawing and painting, sculpting is also a popular form of street art. One of the finest in this sector is Florence-based Il Sedicente Moradi. The anonymous sculptor has claimed that he likes using the streets as the location for his fantastic sculptures as they present a less stuffy alternative to the traditional gallery. He studied classical arts at Florence's Academy of Fine Arts, training as a cartoonist, then a painter and then a sculptor. As his Instagram account proves, this talented chap doesn't confine himself to only streets. His sculptures have been photographed on the beach, in the countryside and in the park. Like others in this list, Peeta's style is marked out by his own signature take on art. It's an instantly recognisable style that creates joining lines, cylindrical shapes and twisting patterns that are created using colours and bold, visually striking lines and angles. Different shades and colours are used to create pieces that reward many viewings over and over again. Peeta hails from Venice and has worked on various projects including Bologna's Frontier Project and the No Limits Festival in Boras. His travels have taken him to work in the US (in Rochester and Chicago) and the UK (Bristol). Take a look at Peeta's website here. Zed1's amazing artwork combines a sense of the surreal with social and political commentary. Born Marco Burresi, Zed1 has been a key player in the urban art scene for more than two decades. 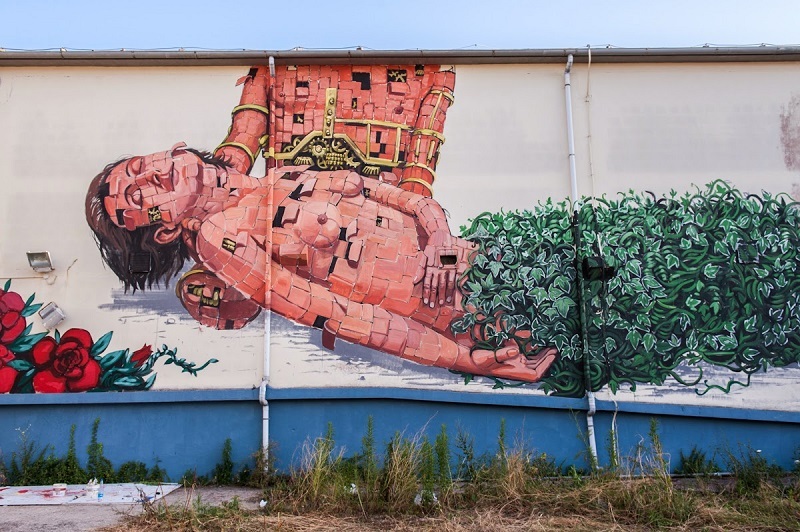 His grand-scale murals have been seen all over the world with works including Doubts Of The Soul in 2014 (completed in San Benedetto Del Tronto). His pieces are detailed and colourful, involving a series of distinctive characters such as puppets, clown and elf-type figures. Zed1's work mixes the visually impressive with an underlying theme of social awareness to instruct people as to the potential dangers happening in the world. Official website here.